"Although primarily a printer, bookseller, stationer and, by 1855, publisher of the Derbyshire Telegraph, he developed an interest in photography, and travelled throughout Derbyshire with friends, taking pictures of architecture, topography and landscapes. He started by selling prints of the high quality photos for which he became reknowned, but also set up and operated a successful portrait studio from at least 1859, produced private commissions for firms, estates and families, and took photos in many other counties. He was an associate of Fox Talbot, and his work reportedly included commissions by the Royal Family. In 1884 he was a founder member of the Derby Photographic Society, he was the recipient of 34 major awards, and he also became President Elect of the Photographic Convention of the United Kingdom." One of those close friends, who accompanied Keene on a number of photographic "rambles" around Derbyshire and other places further afield, was J.A. Warwick (1821-1896). John Alfred Warwick was born in Manchester, son of a Unitarian minister and scientist Thomas Oliver Warwick (1771-1852) and Mary Aldred. After his marriage to Elizabeth Hole Hudson (1832-1904) at Ilkeston in 1854, they settled in Derby, where they had seven daughters and a son over the next two decades. Warwick was soon after appointed telegraph superintendent for the Midland Railway Company, a position he held until his retirement in the 1880s. In the 1891 Census, when he was living at Brook Cottage, Ockbrook, he is described as a pyrotechnist, i.e. he was a producer of fireworks, and his Guy Fawkes displays were reportedly very popular. Amongst many other interests he was also a keen amateur photographer from as early as 1852, and appears to have taken quite a few of the landscapes later published as stereoviews by Keene. The image shown above is one such stereoview, although this particular example is attributed to Warwick on the reverse (see below), with Keene noted as the publisher. John Bradley, who has several views by Keene and Warwick in his collection, informs me that it was from an earlier series probably taken in the late 1850s. Ruins of Ashby-de-la-Zouche Castle, from the Manor-House garden. This is one of the many fine views obtained from the north or garden side of the Castle. On the left is the fine gable and window of Mary Queen of Scots' Room; and in the centre are the windows of the Great Hall, behind which rises the majestic Ivanhoe Tower. Scott has made these ruins doubly interesting, and has given them a fame that will survive when their massive relics shall have crumbled into the dust. As with other photographs published by Keene but actually taken by Warwick, what appears to be the familiar figure of Richard Keene is evident. He is lying prostrate on the grass, apparently writing in a notebook. Maxwell Craven, in his absorbing book Keene's Derby (published in 1993 by Breedon Books, ISBN 1 873626 60 6), describes in some detail the earliest of Keene and Warwick's rambles, through the Peak District in July 1858, and includes a photograph showing Keene with a leather shoulder bag and his notebook seated on the base of the Eyam Cross, taken by Warwick on 27 July 1858 in Eyam churchyard. Picture the Past has another image, possibly from the same ramble. Although attributed to Keene, it was clearly taken by Warwick as Keene is seated in a very similar pose to the earlier photo, on the plinth of the cross at Wheston, near Tideswell. If any other readers have prints of photographs or stereoviews by Warwick or Keene, please get in touch by email. I'd be very keen to see further images, and even feature them here if possible. I've recently updated the article describing a cabinet photograph of a landau taken by "Professor" Frank Simpson of Ashbourne & Buxton, sent to me by John Bradley. Nigel Aspdin conducted some research at the Derby Local Studies Library and was successful in identifying the building in the background as the Railway Hotel in Buxton. The attached photo is from a collection of prints which belonged to my grandmother. Her name was Frances Helen Larissey, later Mrs Nolan of Handsworth, nr Sheffield. I can't identify any of the people in the picture, however the man in the middle of the three men in the back row, bears an uncanny resemblance to my late father. That being the case, it could be my great-grandfather John Larissey (b. 1845) or failing that my great-great-grandfather Thomas Larissey (b. 1810). It would be really useful to try to date the photograph. I still wouldn't be sure of the identity of the man, but it would be interesting to speculate. Unfortunately, the carte de visite is a little faded, and not particularly clear. From what I can make out of the clothes that the women are wearing, the fashions more or less equate to the late 1870s, say between 1876 and 1880. The design on the reverse of the card mount is of a style - with text in a banner & stylized ivy - which was popular in the mid- to late 1870s. Roger Vaughan has a similar example on his web site which is accurately dated at November 1878. It is similar to the design on my profile of Frank Simpson profile, except that it has three "Prince of Wales feathers" motifs at the top instead of the coat of arms. I believe this example may have been slightly earlier than the "coat of arms" style, but the latter is not dated so that's not a great help. The style of the backdrop, the clothes worn by the subjects, the shape of the card and the card mount design all point to a date of around 1877 to 1880, although it is possible that it could have been taken as late as 1881-1882. Older women tended to wear clothes which were perhaps not quite as up-to-date with the latest fashions, and the photographer Simpson, too, being something of an itinerant, may not have possessed the latest amenities in his travelling studio. If that is the case, then it's possibly the oldest portrait by Simpson that I have yet come across, so I'm very grateful for the opportunity to use it - many thanks, Terry. All six of the subjects look as they could easily be in their sixties, although the two in the middle, including the man you referred to, is possibly a little older than the others. I think it quite conceivable that he might be Thomas Larissey (1810-1882). Thomas and his wife Ann (née Fawcett) lived in the village of Loversall, near Doncaster in South Yorkshire, where he worked as a gardener from prior to 1841 until his death on 31 December 1882. I think it quite likely that Thomas Larissey would have travelled to Buxton, together with his wife and perhaps friends or family, for a short holiday in the summer time, as it was a popular tourist resort. I suspect - although I don't yet have good documentation for this - that Simpson spent the summer holiday season in Buxton catering to the tourist trade visiting the Peak District and the hydropathic spas, and went back to Ashbourne for much of the rest of the year. It is also possible, although I believe less likely, that Simpson travelled to or through Doncaster or Loversall taking photographs as he went, as he operated from a caravan. The fact that he lists locations in Leicester, Burslem and London on the reverse of his card mounts suggests to me that he travelled a good deal, perhaps following the village and town fairs. This carte de visite is a standard seated portrait of a middle aged woman in a fairly well appointed studio, which I purchased on eBay a few years ago. The main reason for my interest, apart from it being a well composed portrait and a nice early example of a crte de visite, was because an apparently contemporary inscription on the reverse both identifies the sitter and provides an accurate date. 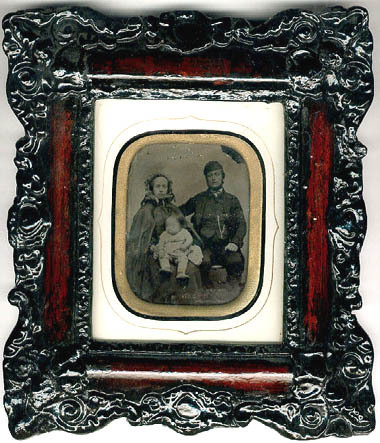 Further research has revealed that the photographer was a Victorian painter, Alexander Frederick A.T. Rolfe (1814-1875), one of a family of sporting artists, and the subject is almost certainly his sister Matilda Rolfe (1816-1896). 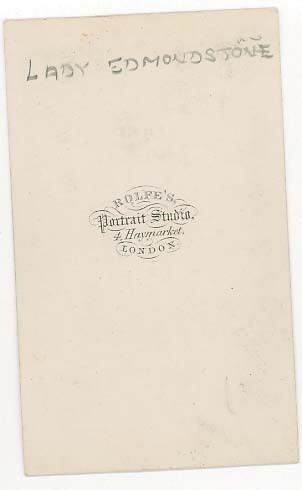 The card mount has the studio address (Rolfe's Portrait Studio, 4 Haymarket, London) and an inscription on the reverse, Miss M. Rolfe, Dec 25th /61. An entry in the photoLondon database shows that Alexander Frederick Rolfe was active as a photographer at this location from 1857 until 1864. Alexander Rolfe was one of at least eight children of artist William Edmund Rolfe (1781-1876) and his first wife Louisa Nicholson (1792-1822). After his first wife died, W.E. Rolfe married Eliza Julia Hopkins (1798-1879), with whom he had another four children. Matilda was Alexander's younger sister, just two years younger than him. She was born in late 1815 or early 1816 at St Clement Dane's, Westminster, London, and never married. By 1851 she was living as a companion with her elderly grandmother at the Goldsmith Almshouse, Acton, Middlesex. From at least 1861 until 1871, according to ceneus records, she was working as a housekeeper to one Henry Reeves, a farmer and landowner, at Rookley Manor, Isle of Wight. This is presumably how she was employed at the time the portrait was taken by her brother. By 1881, she had retired and was lodging in Winchester, and by 1891 was in Weeke, now a suburb of Winchester. Matilda Rolfe died at Islington, Middlesex, in 1896 at the age of eighty-one. He painted profusely and exhibited extensively between 1839 and 1871, and on occasion collaborated with J.F. Herring, his sister Kate's husband. The Rehs Gallery has an extensive virtual exhibition of works by Herring, which are more in the equine and bovine, rather than piscatorial, metier. The National Portrait Gallery has a carte de visite portrait of Henry Leonidas Rolfe taken by Rolfe's Portrait Studio, as well three more portraits of artists by the same studio, probably all taken in the period 1861-1864. 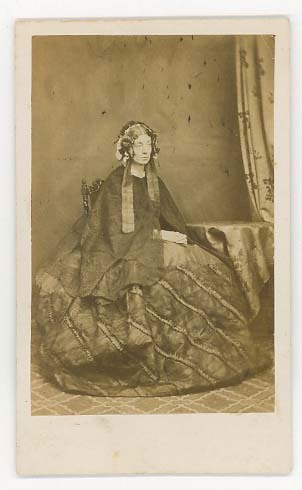 Roger Vaughan has a carte de visite portrait of Lady Edmonstone, with an identical card mount design, on his Victorian and Edwardian Photographs web site, tentatively dated at c.1864. Lady Emma Edmonstone (1804-1891) was the third daughter of Randle Wilbraham of Rode Hall, Cheshire, and the wife of Sir Archibald Edmonstone, 3rd Baronet (1795-1871), a British traveler and writer. In early April 1861, they were visiting at 12 Gloster Gardens, Paddington, London, the household of a West India merchant, John Kingston and his wife Charlotte. The 1861 Census shows Alexander Rolfe living at 6 Richmond Park Terrace, Richmond, Surrey with his wife Harriet "Etty." He described himself merely as an artist, not mentioning the photographic sideline. It is not clear exactly how long the studio operated, but it seems unlikely that it was in existence outside the date range 1857-1864. I'm not aware of any ambrotypes by Rolfe in existence, but presumably if he was in the photographic business in the late 1850s he would have produced some. By 1871 they had moved to 9 Middleton Road, Battersea, Surrey and he is listed as an "artist - landscape & portrait painter." He died at Wandsworth in 1875, at the age of sixty-one.